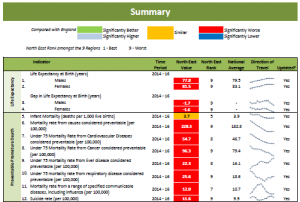 The AHSN NENC Health Surveillance Report, developed by the North East Quality Observatory Service (NEQOS) supports those involved in healthcare in understanding the main challenges across the North East and North Cumbria region. Each indicator is separated to make it easily accessible and manageable for users. Your feedback on the new format would be welcomed, please send any comments to neqos@nhs.net. Click on this link to read the executive summary.